When King Dinis brought his bride-to-be, Isabel, to this pretty Portuguese town it so impressed her that he decided to present it to her as wedding gift. That was over 700 years ago and, for centuries afterwards, other monarchs followed his example. Once within Óbidos’ medieval walls, in a maze of narrow streets and whitewashed houses with geraniums at the windows, one begins to understand the appropriateness of the royal gesture. This is truly a “precious little casket,” as one writer put it - a gift fit for any number of queens. 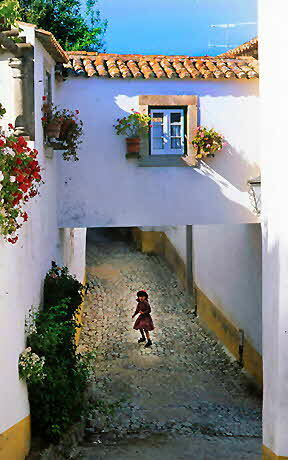 Óbidos perches on a hill about 90 kilometers north of Lisbon and only 12 kilometers from the Atlantic coast. On top of it sits the old castle, the foundation of which is said to have been laid well before the birth of Christ. At first a Celtic fortress, the structure evolved with successive occupants - Romans, Visigoths, Moors, and, finally, Portuguese. For many centuries the castle was a favorite stopover for Portugal’s royalty, and is now a spectacular pousada (state-owned inn). A medieval-looking 5-inch key, attached to an enormous bronze plaque with a relief picture of the castle, opened the door to our pousada quarters at the top of the Dinis Tower. We were now at the highest point in Óbidos, and, through an arrow loop - a narrow slit in the four-foot solid stone wall - we had a limited view of the town below. A knight’s breastplate gleamed from one corner of the room, and in the middle stood a sturdy-looking four-poster bed in dark wood with covers and curtains in glowing red. This was an inkling of what a king’s living quarters were like a few hundred years ago. The castle has several ancient towers. The Moors used to communicate with each other by means of lighted torches; hence the name of one of them, Torre do Facho. Another is called the Barbican Tower, housing at one time a large portion of the Crown’s assets, with an underground prison that, in 1385, held captive the Castilian chronicler Pedro Lopes de Ayalla after he had been siezed in the battle of Aljubarrota - the experience is said to have produced some of his best poetry. There is also the Well Tower, so named because it shelters an interior well. At the base of our tower is the ”Gate of Treason.” It seems that when King Afonso Hevriques overtook Óbidos in 1148, some of his knights entered the Dinis Tower with such apparent ease that the Moorish keeper cried treason. Lunch at the pousada began with the obligatory assortment of cheese, olives, dried prunes, apricots, little hot sausages, and crusty Portuguese bred. We drank the local wine, Gaeiras, which proved to be inexpensive and quite delicious. For starters we shared a cabbage soup and melon in Port. Having decided on the sugesto do dia, we were then served a straightforward but perfectly satisfying Frango na Pócara, which translates into Chicken in a Saucepan. From our cozy window booth in the large dining room we had a magnificent view to the north: battlements and the fields beyond, where Wellington fought his first engagement against the French in August, 1808. Later that day we climbed to the top of the town wall and followed its meandering path until, after about forty-five minutes of exhilarating sightseeing, we found ourselves back at the starting point. The lofty perspective afforded an ever-changing bird’s eye view of Óbidos and the surrounding countryside, and the walk proved quite comfortable despite irregular paving. It was the sort of thing bound to bring a flush of excitement to even the most intrepid photographer. 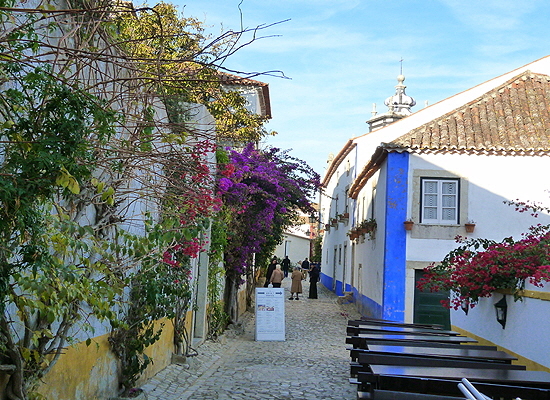 Rua Direita is the principle street of Óbidos. It begins at the town’s southern tip, at the main gate, and stretches all the way to the castle-turned-pousada in the north. This is where most of the stores, the tourist office, and many of the cafés and restaurants are. Dua Direita also features some buildings of historic interest, notably the Church of St. Mary, which is set off from the street by the town’s small square. 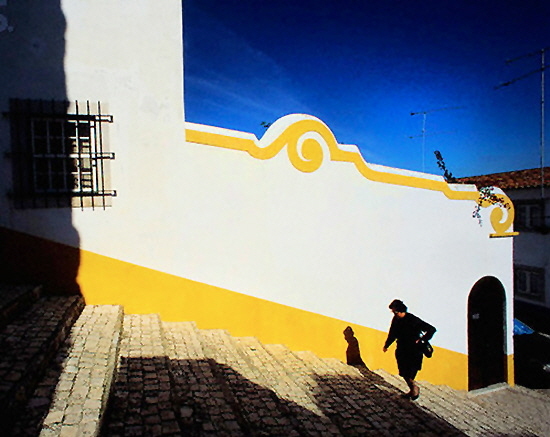 St. Mary is only one of the churches in tiny Óbidos, but is the oldest and most important. Originally a temple built by the Visigoths, it is presumed to have been a mosque before the Christians reclaimed it in the 12th century. From here came the prior who went on to become Portugal’s first saint (Sao Teotonio) and it was here, in 1441, that Afonso V, aged ten, married his cousin Isabel, aged eight. Stepping inside the church one is met with a wealth of that Portuguese artform called azulejos. These blue and white tile adornments became a national passion in the 17th century and are still adding a distinct graphic flavor to the country. Azulejos are everywhere: in official buildings, restaurants, and on the facades of private homes. The older they are, the better they usually hold up to artistic scrutiny and these in St. Mary were made in 1678. 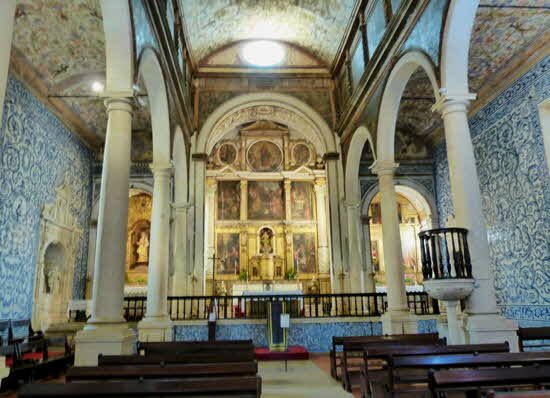 The church also has a number of paintings by Josefa d’Óbidos, a talented lady from the same period. On Rua Direita I found Bar Ibn Errik Rex, a dark cellar-like tavern where a large bottle of the local wine was set on each table and with a ceiling from which hung 1,700 mini-bottles. The proprietor informed me of the impressive number as he placed a small ceramic grill on the the table. I had asked for sausages, which I understood to be a house specialty, and was now treated to the spectacle of seeing them prepared. Hot, spicy, and washed down with a cold beer, they definitely hit the spot, and set me up for another camera-lugging foray into pretty little sidestreets which soon narrowed into what would more accurately be called walkways. Most of the white-washed houses had yellow or blue stripes painted on them. Everything was on a small, intimate scale: archways, cobblestone and, in one instance, positioned next to a blue doorpost, a broom, a cat, and a pair of well-worn shoes. Flowers abounded, as did laundry hung out to dry. 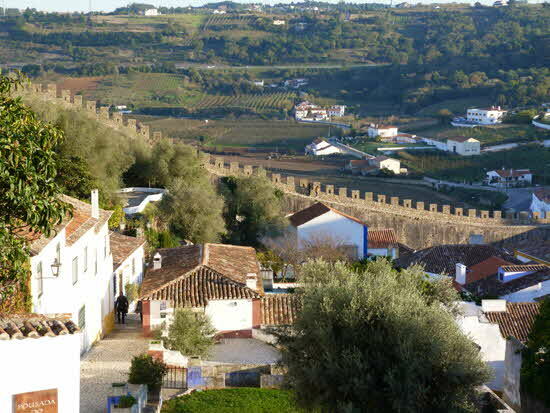 Óbidos is not entirely bounded by its walls. In the 16th century, when enemy attacks may no longer have been a threat, some of the inhabitants moved outside, building their houses next to the eastern wall, where they would be protected against the strong winds from the Atlantic. This section of town has its own 16th century church (Igreja da Terceira), a well-preserved fountain from the same century, and a couple of good hotels and restaurants. 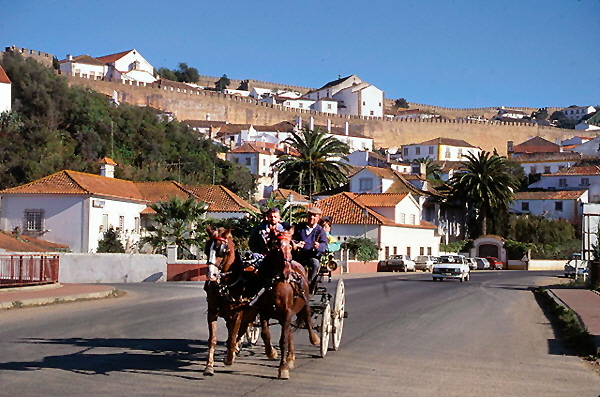 To the traveler, Óbidos offers the added attraction of being comfortably close to a number of other interesting little towns. We visited three: Alcobaca, Batalha and Nazaré. The first two are dominated by great religious structures, each erected by a king after he had won a resounding victory in battle, and the third has often been called Portugal’s most famous fishing village. Today the monastery is famous mostly for the tombs of Pedro the Cruel and Ines de Castro, the couple who supplied Portuguese history with some of its juiciest and most morbid material. Their torrid love affair, which ended with the assassination of Ines, had a particularly gruesome postscript two years later. Pedro was then the king and in position to seek revenge on the murderers. He did so by having their hearts drawn out from their living bodies. The lovers now rest in the huge monastery in two separate tombs, foot to foot, so that when they rise on the Day of Judgment, the first thing they will see is each other. What the Abbey of Santa Maria da Vitória in Batalha lacks in terms of such sensational tales it makes up for in sheer beauty. 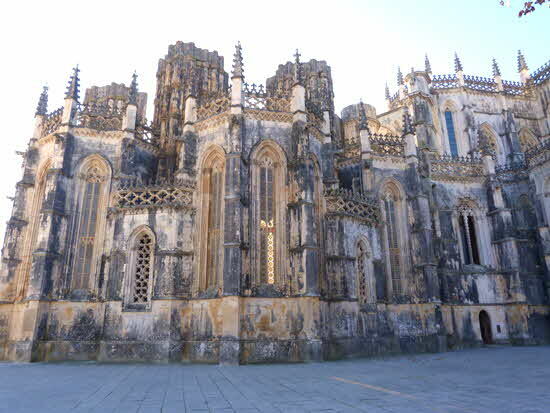 This stunning edifice, often described as the most beautiful Gothic building in Portugal, was built by King John I in fulfillment of a vow he made before the battle of Aljubarrota. I spent almost an entire afternoon wandering around in its various rooms, and was especially taken in by the Royal Cloister - a Thousand and One Night Manueline fantasy in which stone had been used as if it were lace. 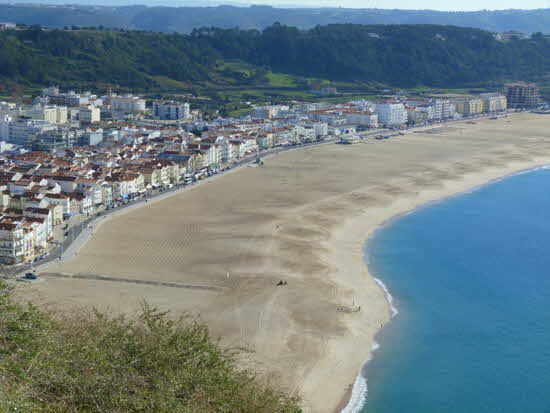 Nazaré was our last stop. From a visit several years ago, I recall eating a superb whiting, drinking white wine, and watching the fishermen ride the heavy surf in their colorful boats. Now there is a a protected harbor built just south of town that provides safe mooring, but, at that time, men with ropes used to pull the vessels ashore and, in even earlier days, oxen were sometimes employed. The great curving beach was now largely occupied by trays of fish laid out to dry. Women in black were rearranging the catch or putting up nets for protection against swooping birds. The Atlantic, which washes the coast of Portugal from north to south, provides some of the best fish and shellfish in the world, and the Portuguese know how to prepare it - with great simplicity. In a quiet back street we found a two-table restaurant with an outdoor grill, where I had some absolutely fresh sardines sizzled over charcoal and my wife ate ameijoas, Portuguese clams, steamed in garlic. With local bread and wine, it was all very simple, very delicious, and quite unforgettable. © March 2018 LuxuryWeb Magazine. All rights reserved.